...that the Devil Splicers unearthed SIVA in the Plaguelands after learning about it in files scavenged from Clovis Bray's headquarters? The Shock Blade is an edged weapon commonly wielded by Fallen Captains and Vandals: these include, but are not limited to, Elder Captains, Enhanced Captains, Enhanced Vandals, Fused Captains, Perfected Captains, Stealth Vandals, Splicer Captains, Splicer Priests, Splicer Vandals, Wolf Enforcers, and Wolves' Guard. Barons are included in this. The Blade is also employed by an unknown Fallen faction during Destiny 2. These full-length edged weapons gather Arc energy from a system of shock cores and charging caps in the hilt, converting the entire length of the blade into a plasma cutting torch. Brutally efficient in the hands of a skilled Captain, Shock Blades are not ceremonial weapons built for show. Guardians would do well to respect the threat they present. 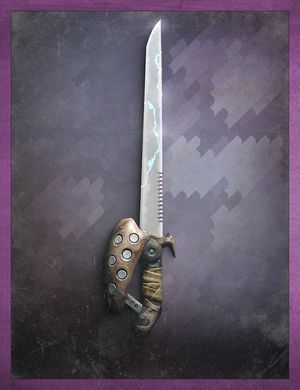 Shock Blade renders from Destiny 2.